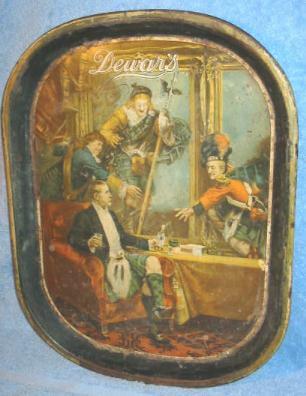 Whiskey Tray – 12 1/2 x 16 1/2 inch, Dewar’s tray. Very early, heavy tray showing three intruders attempting to heist the bottle of scotch from a scottish gentleman in kilts. This definitely shows it age with quite a bit of rusting and wear. Good news is that colors are decent and the subject matter hides the damage pretty well. Nice tray if you’re not picky. Being Sold “AS IS”. The worst of the damage is the rim and the area where the face meets the rim.